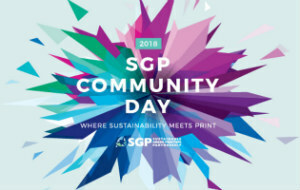 SGP, the Sustainable Green Printing Partnership, announced their upcoming community day – “Where Sustainability Meets Print”. SGP is considered to be one of the leading authorities in sustainable printing certifications for print manufacturers. The 2018 community day will be held on Nov. 14 at the Renaissance Hotel in Cincinnati, Ohio. The event is all about connecting leading printers with brands and print buyers, all working together for a more sustainable supply chain. As posted in this article – SGP Community Day, SGP appointed Liz Moyer as the event manager. The event brings together leading sustainable printers, Fortune 500 brands and suppliers to discuss how to further improve sustainability performance in the printing industry. It will include presentations and discussions on the state of sustainability in the instore retail, packaging, textile and more. The day concludes with a gala dinner celebrating the 10th anniversary of SGP. For more details see here: SGP Community Day 2018.